Webinar Replay: Is Your Managed Service Provider Helping You Enable Innovation? Many businesses across several industries need to constantly innovate and evolve to compete in a changing market. Technology invariably supports much of the innovation as businesses look towards digital transformation at various stages in their strategy. But, while the business looks to transform and focus on the strategy and execution, the underlying technology to support those initiatives will get more and more complex. 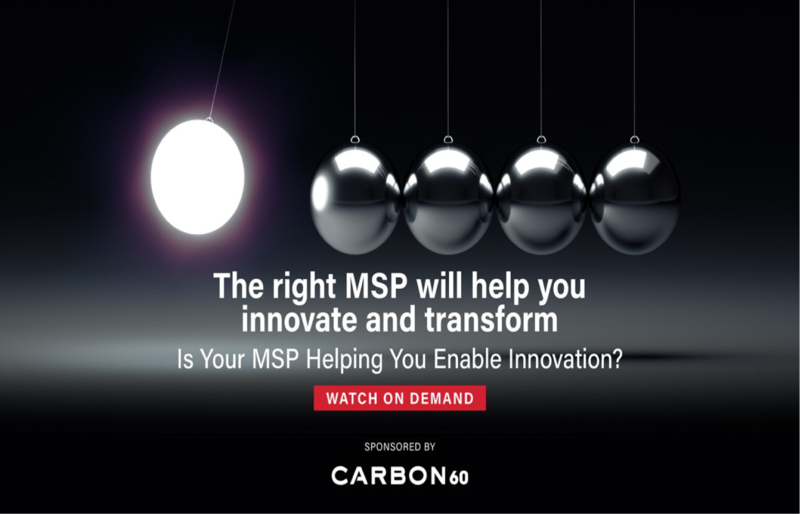 In this engaging webinar, IT World Canada’s CIO, Jim Love, moderates a dialogue on how managed services providers like Carbon60 help companies on their innovation journey with managed cloud infrastructure as the foundation to build upon and move forward. Melody Collet, SVP IT & Operations at Comda Advertising Connections, provides a customer point of view on how best to team with a MSP and shares valuable advice that IT leaders can leverage. Bik Dutta, Carbon60, outlines the key elements of strong managed services and IT infrastructure outsourcing relationships and the internal customer experience culture that is critical to Carbon60’s success. Chris Christianopoulos from HPE provides a market snapshot of the continuing trend on how enterprises in Canada and globally are moving towards consuming IT as a service with partners like Carbon60.